Museveni also accused some unnamed foreign countries of seeking to influence the nation's politics by funneling assistance to the opposition through non-governmental organizations. "It is important that external players refrain from interfering in the internal affairs of other countries," Museveni told a press conference on Sunday. "If there's any problem in Uganda, I surely will handle it better than the outsider." Last week the U.S. lawyer for opposition lawmaker Robert Kyagulanyi, a musician known by his stage name Bobi Wine, called on the United States to stop funding Uganda's military as a punitive measure against what Kyagulanyi said was torture by authorities in his country. Kyagulanyi, who has emerged as a formidable threat to the president, was charged with treason over his alleged role in the stoning of Museveni's convoy during campaigning for a parliamentary seat. 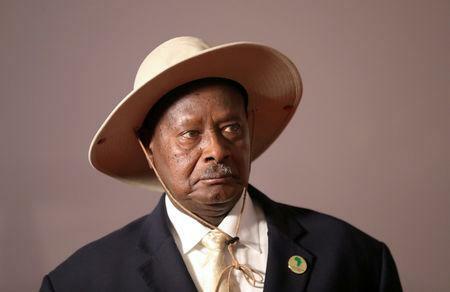 "NGOs (non-governmental organizations) funded by foreign governments actually give money to opposition players, give advice, lie on their behalf," Museveni said. In July, the constitution was amended to remove the presidential age limit of 75 years, meaning Museveni can run again for president in 2021 -- the year the country hopes to begin oil production.